Back from vacation and I'm not wasting any time. When I went to my favorite Chanel counter to pick up the fall collection (on which I will soon do a post), the wonderful artist there told me they were going to hold a Master Class to show the techniques they learn, and asked if I would be interested. 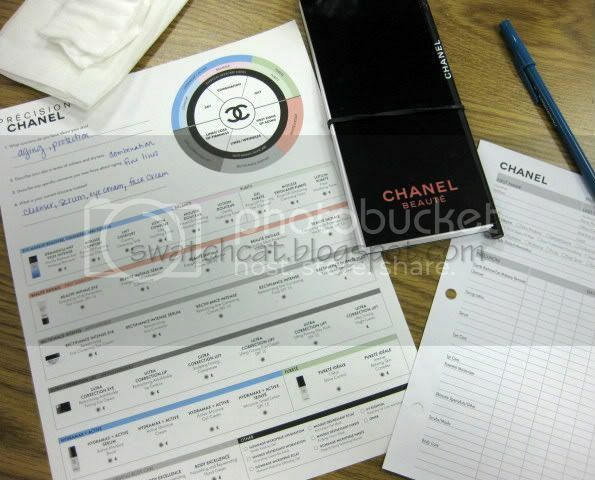 A class all about Chanel?! Lucky for me it was being held the day after I returned from vacation, so "Sign me up! ", I said. The class was a two hour long session in which we learned about what the Chanel line has to offer, and then were shown how to do a simple smokey eye. Being that I'm fairly proficient in makeup application, I wasn't so interested in learning how to apply makeup, but it was nevertheless informative, and gave me the opportunity to try out colors I never would've chosen in a million years. More on the class and some pictures! We first started off by going over the skincare line. I've heard so many good things about the line, so I was rather interested in trying it out. My particular skin type is combination, and I am juuuuust starting to see fine lines form. I was recommended to use the Mousse Douceur and Lotion Douceur for cleansing and toning. Honestly, for the last few years, I've shied away from toners as believing them to be drying and an unnecessary skin product. However, it was explained that toner is meant to be used immediately following cleansing to restore skin's pH balance. After cleansing my skin with the Mousse Douceur, I used the Lotion Douceur and my skin felt clean, and not at all tight (which is a sign that your skin is dry). For the moisturizer, protection and correction, the new Ultra Correction line was recommended for me. I started off with the Ultra Correction Line Repair Serum, then applied the Ultra Correction Fluid, which contains SPF 15, much to my delight. I then patted on the Ultra Correction Line Smoothing Eye Cream. We were told to use our ring finger, as it has the lightest touch, and supposedly it is the warmest finger since it has a direct artery to the heart. I don't know how true that is, but that is also the reason the ring is worn on that finger, as well. Either way, I've always applied my eye cream and concealer, for that matter, with my ring finger. Finally, I finished with the UV Essentiel SPF 50. Now, these products are quite pricey (starting at $45 for the cleanser all the way up to $190 for the large size serum...and that is just for the line I used). A little goes a long way, but that is the case with most skincare lines. If I had moola coming out the wazoo, then I probably would indulge because the products truly feel wonderful on and my skin does feel fantastic. But until I hit the jackpot, I'll be sticking with my current skincare routine (I'll do a post on that sometime). Next, we were color-matched for foundation. I'm going to say something a bit shocking here - I rarely wear foundation. 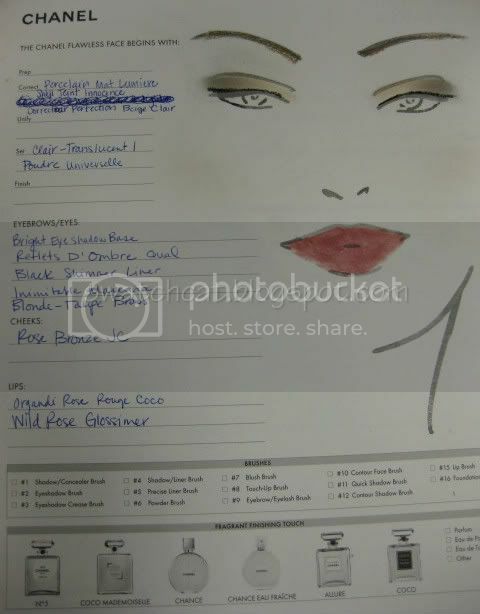 In fact, I purchased a nice expensive Dior foundation for my wedding (6 years ago) and ended up having to throw it out because it went rancid before I could use it up. It was practically full. I'm not trying to brag, but I've been blessed with an even skintone, and I rarely break out. 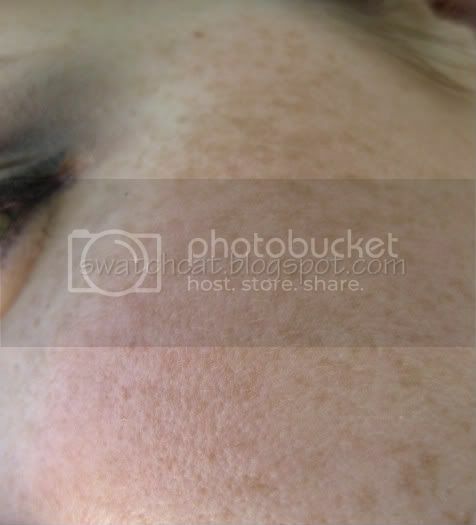 So many women lament that if they had nicer skin, they would love to not have to wear foundation. Since I do, I don't feel the need to cover it up. But, for the purpose of the class, I did try out what was offered. I'm truly a pale, pale person. I matched pretty closely to Mat Lumiere 'Porcelain' and that is with my summer tan. I don't let my face see too much sun, but it does have a slight bit of color to it. I'm fairly certain that my winter skintone is too light for anything Chanel has to offer, unfortunately. 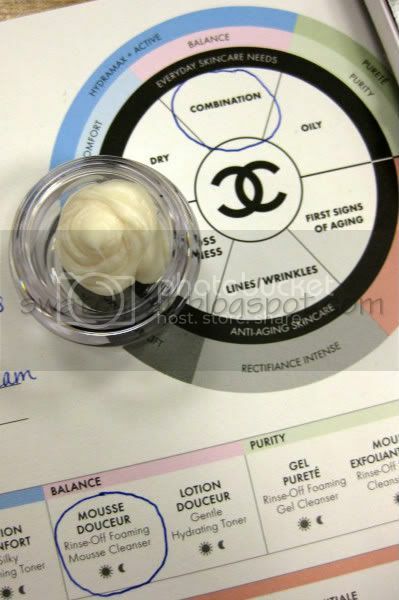 Now, the concealer I am really excited about, and once I've used up my MUFE ones, I will be purchasing the Chanel. I matched for the lightest one, Correcteur Perfection in 'Beige Clair' - no shocker there. It completely covered my under-eye circles and a couple of little blemishes (courtesy of "that time of the month"). So far, there is no fading, creasing or caking, and it is a pretty typical summer day here - hot and humid. I set my foundation and concealer with the Poudre Universelle in 'Clair - Translucent 1'. Being that I rarely wear foundation, you've also probably guessed that I rarely wear powder, and you'd be right. I won't deny that the foundation and powder aren't nice. They really are. I just prefer the look of my bare skin. But, if I ever find myself needing foundation and powder, I just may trek over to my Chanel counter and pick up those items. After prepping our faces, one of the artists did a simple smokey eye demo. 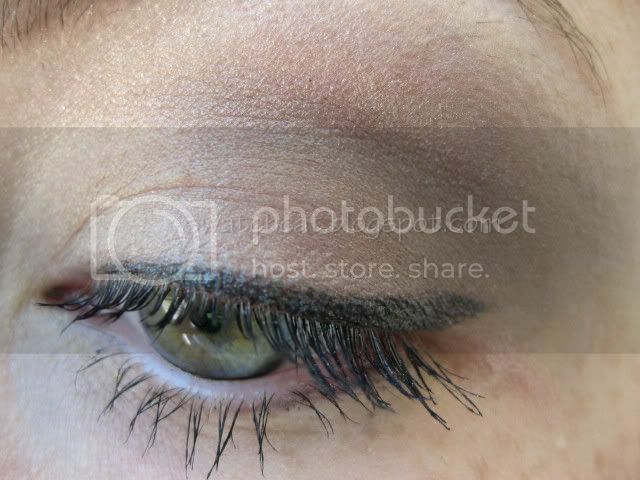 He began by prepping the lids with the Base Ombre A Paupiers in Bright. He then, using the Reflets D'Ombre Quad and the #11 Chanel Quick Shadow Brush, swept the lightest color (a white with light golden shimmer) over the entire lid up to the brows. 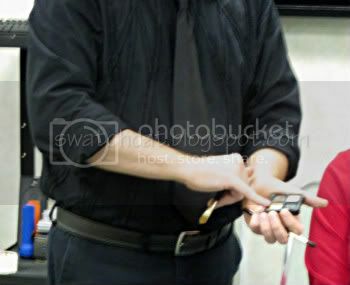 Next, he took the plummy brown shade and patted it over the outer 1/2 of the lid and crease. 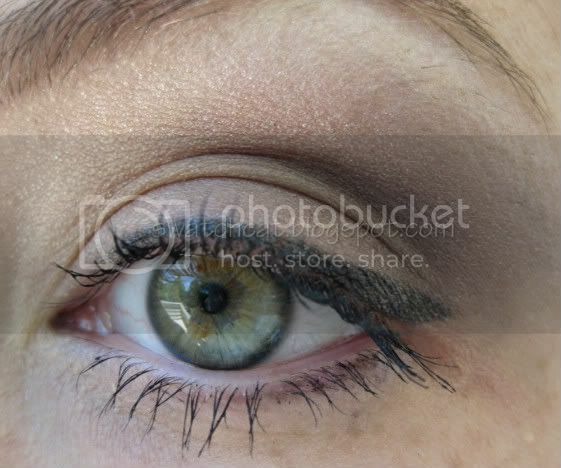 Using the #12 Chanel Contour Shadow Brush, blended the plummy brown into the golden white. Then he took the dark teal and, using the #11, patted just a little into the outer corner and up into the crease, and then blended it, using the #12, into the plummy brown. 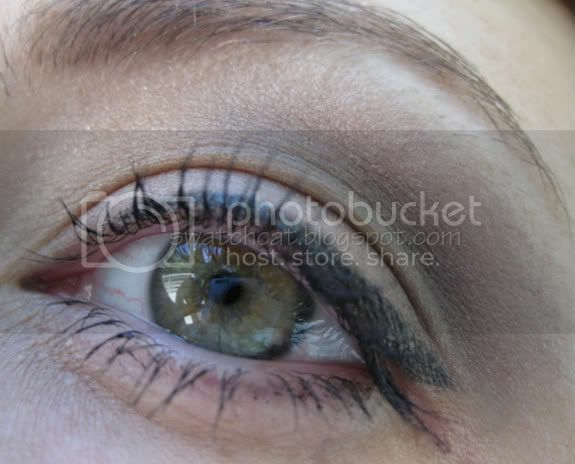 He then lined the eyes using the Stylo Yeux Waterproof Liner in 'Black Shimmer', doing the entire upper eyelid, and just the outer 1/3 on the undereye. Finally, he finished off with a coat of Chanel Inimitable Mascara, which I really think is the best mascara out there. It separates, lengthens and curls. 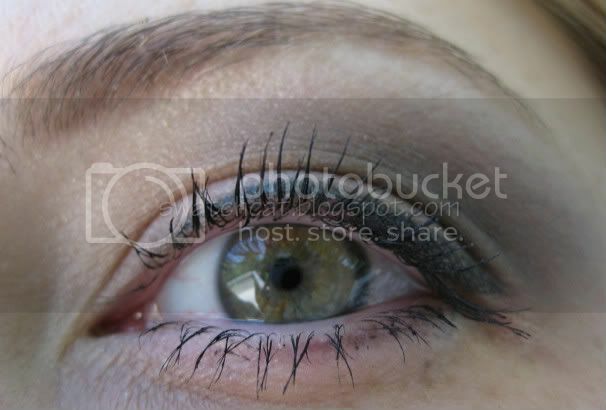 I usually don't even use a curler with this mascara - it's that good!! We then set off to duplicate the look ourselves. I was really please with the way mine turned out. I never would've chosen to use Reflects D'Ombre on my own. The deep teal was turning me off. However on me, it ends up being more of a deep forest green. So far, the shadow base has not creased on me, but I'm willing to part with my Urban Decay. 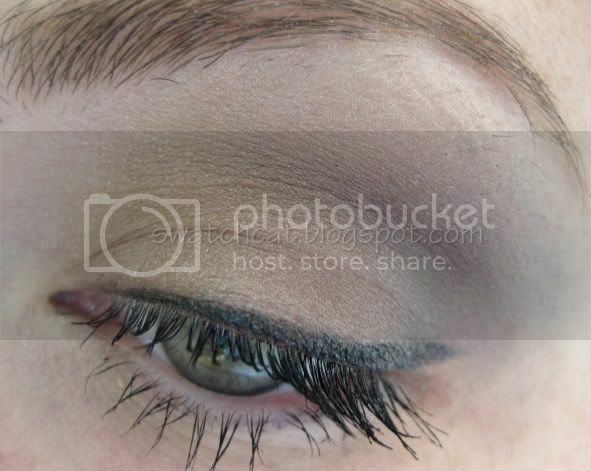 Once I finished my eyes, I filled my brows with Le Crayon Sourcils in 'Blonde-Taupe'. Since we were away from the counter, we were only given a small selection of colors to used, and I wasn't thrilled with the blush choices. One was Tweed Corail, which I didn't think would look too good, so I chose the other option, Rose Bronze Joues Contraste. Again, Rose Bronze is not a color I would've normally chosen for myself, but it ended up looking really pretty and gave me a nice, neutral flush. I don't think I'll be purchasing it, as I just got Rose Temptation, and they both look about the same on me, with RT being just a little pinker (as I prefer it). I finished off my look with Organdi Rose Rouge Coco and Wild Rose Glossimer. I had such a difficult time picking which lipstick, being that there are a ton, but I went with Organdi Rose because it was such a nice, light pink with a hint of brightness to it. 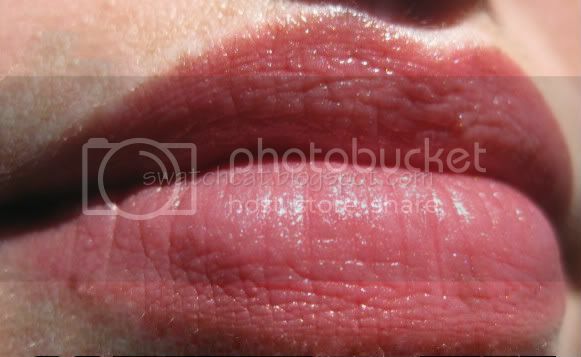 Wild Rose really just complimented OR nicely, and added a pretty shimmer. Even though the class was free, I always feel compelled to purchase something. I know that really is their ultimate goal, but I also know that the three artists took the time to put the class together, and it was time away from the sales floor. I ended up getting Reflets D'Ombre Quad, Wild Rose Glossimer, and Coral Love Glossimer (which I'd been eyeing but didn't get with my initial fall collection purchase). I fully intend on getting the concealer once I've used up my stores. 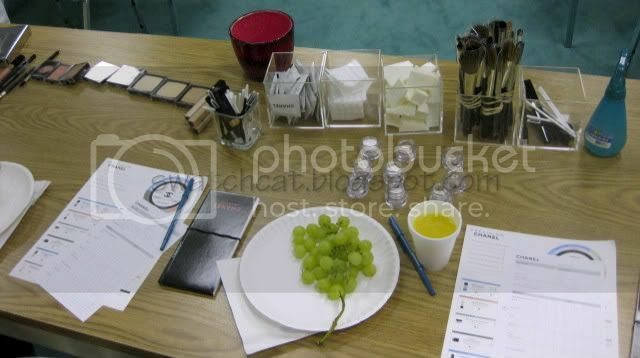 We also received a little gift bag with samples,and a cute little Chanel notepad and pencil for attending. Can't wait to whip out the notepad at the grocery store! I had a fun time at the Master Class, and I highly recommend attending one if you are able. My counter hopes to do a more advanced one in the near future, and I hope to attend that one, as well!